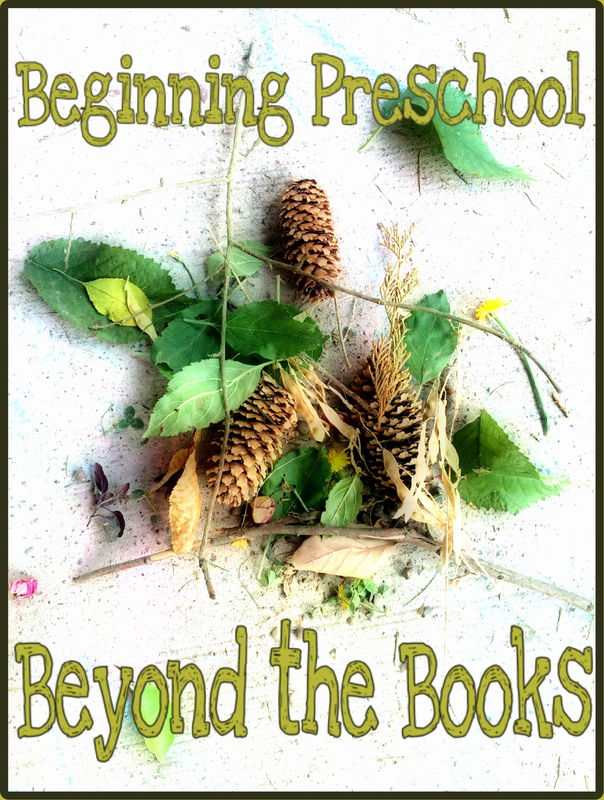 Grow Wild My Child: 5 Ways We Took Preschool Beyond the Books--Our First Week! 5 Ways We Took Preschool Beyond the Books--Our First Week! Four years old and incredibly excited to start school. Well, in his words, he wanted to “go to university” but we explained to him how he had to take first steps first. It feels like we are always teaching him new things and he’s just a little sponge anyway, so preschooling at home seemed like a great idea to me, too! So we got tiny backpacks (sister couldn’t be left out), some basic supplies, and a few simple work books. We added in what we already had at home (crayons, glue, ruler, scissors, “science” books) and his anticipation was tangible! We weren’t going to start until the local schools did, but I realized his excitement was not going to allow his supplies to wait at this point, so we set a start date for the following Monday. At last the day arrived and he powered though all his lessons and put his stickers on his chart like a champ! As I woke him up for our next day of school I told him with enthusiasm, “and we get to do school again today!” To which he responded, “MOM, do we HAVE to! ?” Really!? That was all I got!? ONE day of excitement about school! Boy, I was going to have to get creative, and quick! =) Thankfully, as soon as we started, he was really into it again. But it definitely got me thinking about how I was going to keep this boy engaged. 1. Stick Letters: Thankfully he can form his name with mostly straight lines. Our only trouble was his sister trying to rearrange the letters to suit her own creativity! I’d like to try this again with other new words as he learns them. 2. 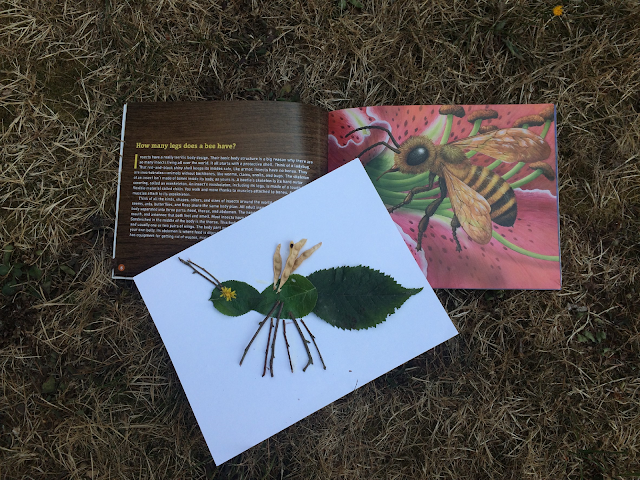 Insect Anatomy: As we read about the basics of insects this week, we decided to grab a bag and collect whatever little pieces we thought we might be able to glue down. We counted antennae, wings and legs of our newly made insects and found symmetry in that the insect would have the same number of parts (legs/wings/antennae) on one side as it did on the other. Then we were able to examine a couple live ants in our driveway! 3. Chalk Tracing: I know not everyone has a place to scrawl on with chalk (this is the first time we ever have!) but could be done just as easily with crayons/markers on paper. This is all over Pintrest, but the idea is that you write a simple word (I did mine in a pale yellow so he could really see his red or blue chalk over it. Then we would talk about the sounds each of the letters made and blend them together until he read each word! This last step took a little determination, but he was so excited when he did finally READ a word! 4. 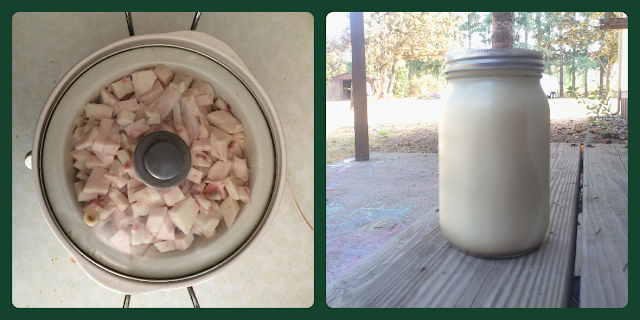 Rendering Lard: I’ll be writing a post about this later, but this was a fascinating experiment! For those of you who do not know, lard is pig fat that is rendered through a slow heating process. It’s used like shortening in baking and is making a comeback for it’s natural, healthful properties (Lauren goes into that in a little more detail on her page). Anyway, this led to some interesting conversations about what lard was, and then what fat was, why our body needs it, but not too much, and what was left over after the lard was removed (small portions of muscle, blood vessel, and tendon) and then their role in the body. 5. Baking: I’m not going to lie, here: baking with these wee ones can be super stressful sometimes. I’ve come to realize that many recipes are more forgiving than they let on, because there is no way we ended up with the right proportions of the ingredients! But, we were able to use some of our fresh lard to make snickerdoodles (having cookies as an end product is always great inspiration to be a good helper!) Although they don’t understand the fractions or even the measurements yet, we talked about them and he was really pointing out which measuring cups were bigger than others and asking about why we needed one teaspoon of salt instead of one cup! We still did our work books, science reading, and bible verses, but doing the extras and taking it outside sure kept him focused longer. And with much more enthusiasm! I hope these ideas have sparked some ideas of your own! What have you done to keep your little ones engaged? I would love to hear how you find ways to incorporate real life into your school!